Queen Size Mansion bed with 6 under bed storage drawers. Constructed of sturdy white pine. Available with or without the engraved star. 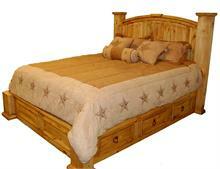 Call for pricing on other available bedroom pieces.